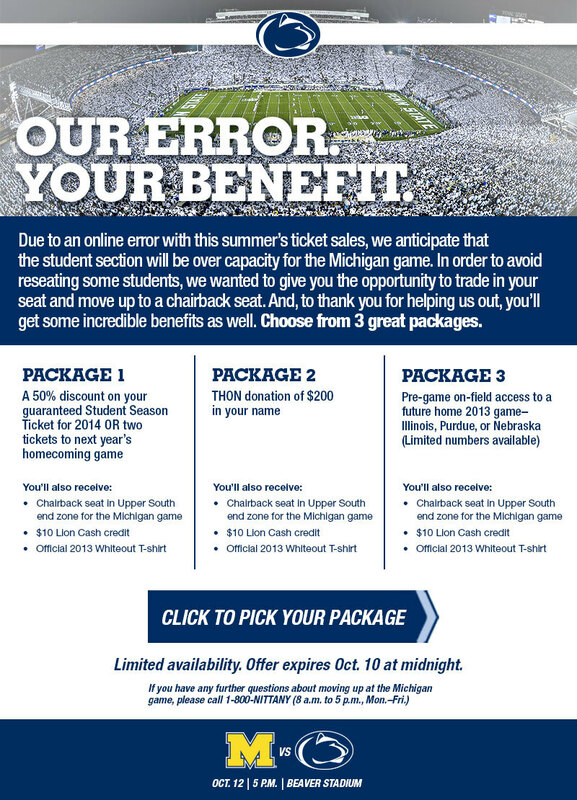 Apparently a “TicketMaster glitch” caused Penn State to oversell student tickets to Saturday’s game against Michigan. The opposite of having too much inventory you can’t sell is selling inventory you don’t have and confirming orders you cannot fulfill. Both can be equally costly – inventory absorbs resources that could be better spent elsewhere, while unfulfilled sales means extra effort required to rework the problems and a loss of credibility. Penn State football just ran into such a problem. Due to a “TicketMaster glitch” Penn State oversold student tickets to this weekend’s white-out game against Michigan in Happy Valley – already confirmed as a sellout – and are now having to backtrack and request that some students voluntarily surrender their tickets in exchange for one of three “please pardon our mess, thank you” packages that could give students discounts or special privileges at future events. Even though the game is a sellout, each of the three packages still allow students to sit in another part of the stadium so they still get to see the game but get the added benefits. Had Penn State done things right the first time (talking about tickets here, not that other scandal) they wouldn’t have had to spend as much in implementing corrective actions.